Martingale collars are a great tool to help train your dog. 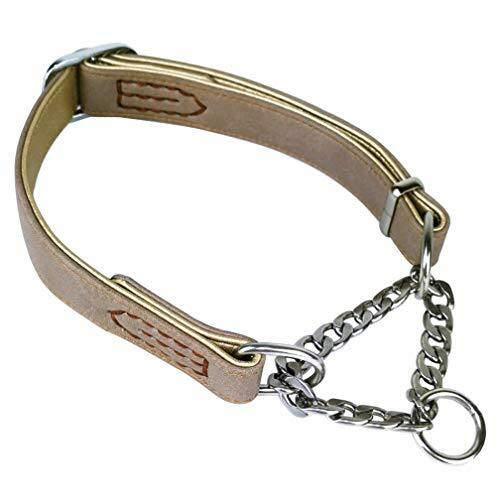 They are also great to use as a day- to- day collar for walking your dog. As many trainers use Martingale collars, various methods and techniques exist. We recommend that you to seek the advice of several trainers to determine which method of training works best for you and your dog. 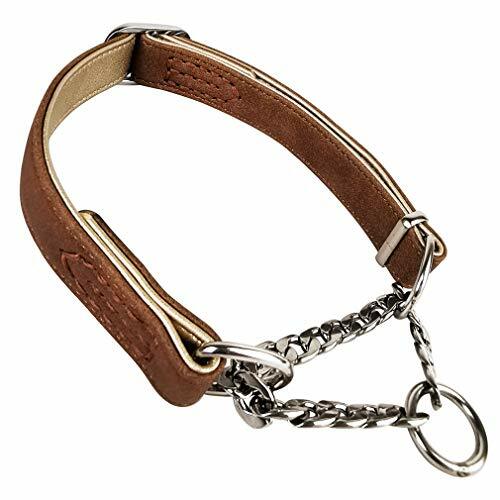 Please note Angel Rio Martingale collars are measured from leather tip to leather tip (not including chain links). 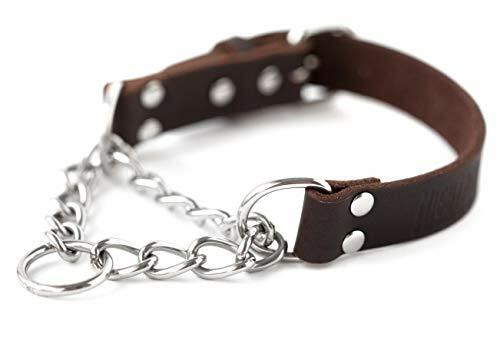 You will find 2 measurements: The collar completely fastened/ tightened (minimum circumference: end loops touching), and the collar fully extended (maximum circumference: chain links stretched out fully). 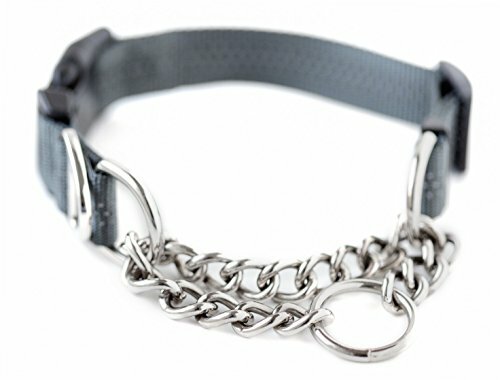 (A) If you want the collar to adjust exactly at the rings, select 1 size down from your dog’s neck size. Example: If your dog’s neck measures 20”, select the 18” Rio Martingale collar. 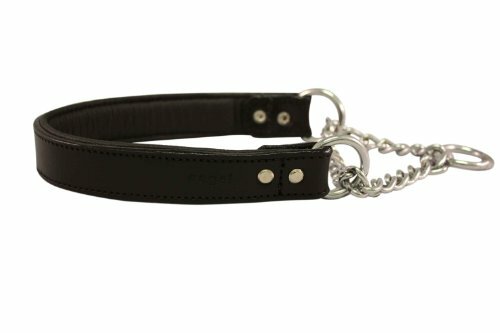 (B) If you want the collar to squeeze the dog’s neck when pulled, select 2 - 3 sizes down from your dog’s neck size. Example: If your dog’s neck measures 20”, select the 16” or 18” Rio Martingale collar. Brand: Angel Pet Supplies Inc.
Are you looking for a martingale dog collar or a puppy collar? 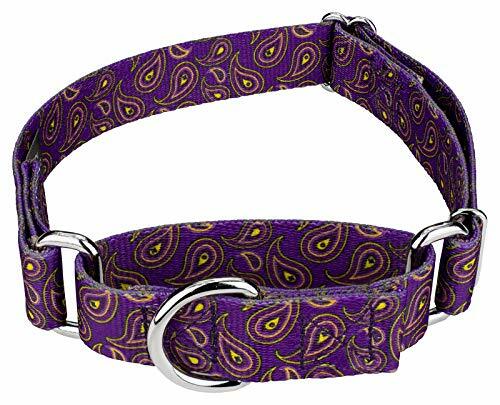 This is a leather dog collar in martingale style! 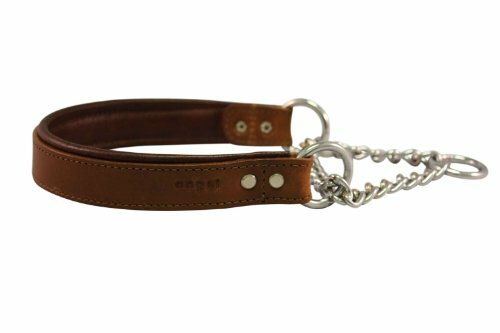 Martingale dog collars are made out of specially treated very soft genuine leather. Rolled (Round) collars are particularly well suited for long haired dog breeds. The round shape prevents tangling and damaging dog's fur. Our dog collars are soft and supple but yet strong and durable. Completely safe for your dog and non-allergic martingale collars for dogs. Leather dog collars and collars for puppies will fit dogs with sensitive skin. When your doggy pulls, the martingale dog collar creates tension around dog's neck, allowing you to control the choking effect. This collar is great for training and getting control over you dog if it disobeys without doing any harm. Martingale dog collars are available in different bright and trendy colors: blue, red, orange, lime green, brown, pink, yellow, purple, black, navy blue, mint green, beige and white. Our handmade durable dog collars and puppy collars are available in different sizes: extra small, small, medium, large and extra large. Before placing an order, please measure your dog's neck circumference with a soft measuring tape to choose the correct size. Fourhorse Pet Collars Fourhorse pet strives to offer high quality and unique designer fashion pet collars to satisfy your diverse needs. If you have any suggestion or unique demand about our products, you are welcomed to contact us. Fourhorse: Soft and Comfortable The buckle for great strength and durability. Handmade Adjustable for a perfect fit. Perfect gift for dogs and cats. 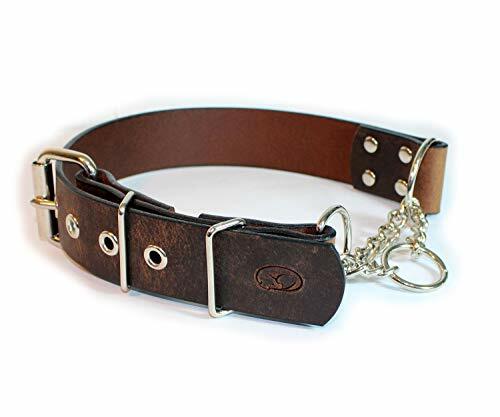 Collar Size Information: Large Width:1"inch, Adjustable Length:15"- 21.7"
Our adjustable leather martingale collar has a number of upgrades for the strong and stubborn pullers out there. We start with thick leather, then add strong double cap rivets and grommets to help prevent stretching and deformation from strong pullers. Our collars feature a half-check chain with welded nickel plated steel O-rings, a D ring for attaching tags or lights and a smooth rolling buckle. The collar opens fully to adjust, so you do not need to worry about how thick your dog's head is when ordering. Important Sizing Information. Our martingale collar sizes are measured at its largest -- i.e. when the collar is relaxed. When sized correctly, the collar should shorten by 2" when pulled taut. We recommend you measure your dog's neck and add 1" to match up with our listed sizes. Please do not leave dogs unattended while wearing martingale or choke collars, these are meant for use while walking. 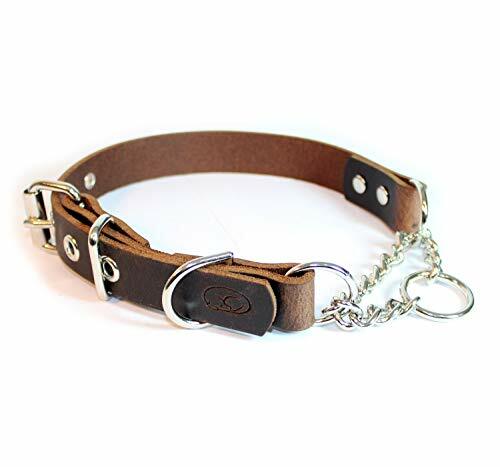 *Collar Size: M:1.4cm width,0-20.5"lengthL:2 cm width,0-21.5"lengthXL:2.3cm width,0-23.5"length *Brand name :Didog *Material:Genuine leather *Classify:Genuine Leather P Choke Chain ,Adjustable Dog Collars *Feature 1: Soft * Comfortable : Made of high quality soft genuine leather that has a soft and comfortable hand feel. *Feature 2:P chain style:Neck size is adjustable,so can make training and walking be easy for medium and large breeds. *Feature 3:Golden metal parts never rust and are stitched for durable use. *Please note that we are manufactory products,price is competitive and quality guarantee. *If you are pleased with the product and service,please don't forget to leave me encourage feedback. *If you do not satisfaction with the product quality and service,please contact me first.I will solve your problems as soon as possible. 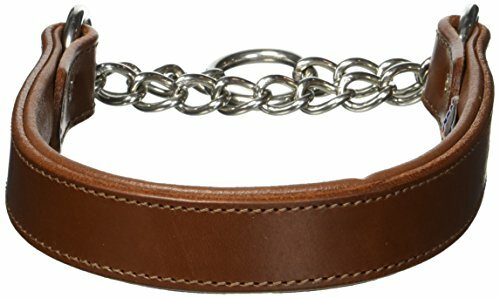 Bold Lead Design's unique Martingale Collar is adjustable and has a clip to make it super-easy to take on and off your dog. Handmade from beautiful American leather with high-quality hardware for a collar that will last a lifetime. Handmade in the USA of USA vegetable tanned leather and solid brass hardware: The golden tan brindle Leather is 100% American vegetable tanned leather, made with no dyes or toxic metallic chemicals. Reminiscent of fine English horse tack, this leather is superior in quality to any other collar you've seen. Every collar is hand-oiled to bring out the softness, so your collar arrives supple and only improves with age. The color will darken with use and age. Best for walks only: Martingale collars are best worn on walks only (and not all day), since the loop is more prone to get caught on furniture, etc. Also, please note that the brass hardware may naturally tarnish and rub off on light colored / white dogs if the collar is left on all the time. The staining is totally safe and will wash off with soap and water. Lifetime warranty! Please note that damage due to chewing is not covered by the warranty. Collar measurements are in fully open position. When measuring your dog, please measure neck size and add 2". 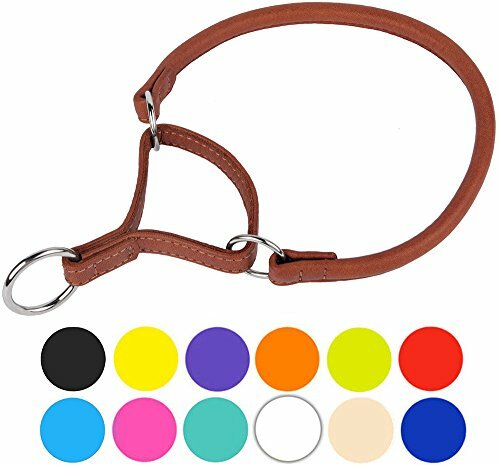 Soft Genuine Leather Martingale Collar is the next generation of super soft and durable collars that provide exceptional comfort and support for the dog and its owner. 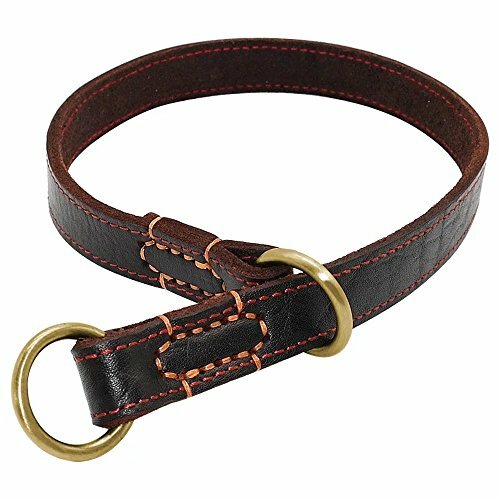 The best feature about our Soft Genuine Leather martingale Collars is that it provides special control and most importantly safety in any situation. 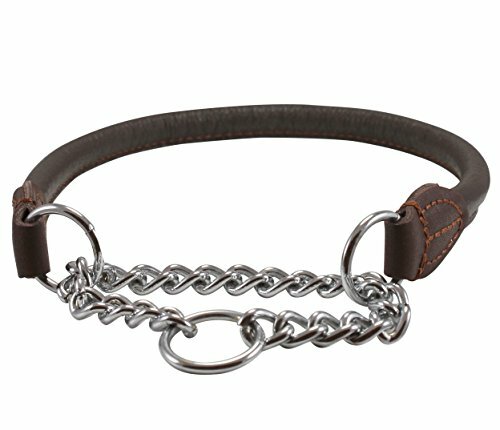 Super Soft Genuine Leather Choke Collars are available in a 2 earthy colors and 10 different lengths. These fine leather slip collars are made of 100% leather that can be mixed and matched with our Soft Genuine Leather Leashes. 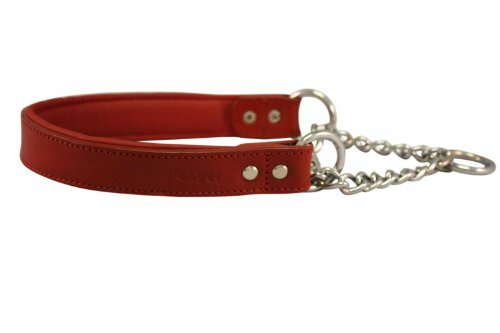 Soft, strong, durable, and light Martingale Dog Collar made of high quality genuine rolled leather. Features nickel-plated hardware for durability and resistance to rust and tarnishing. Comfortable collar for daily walks and training. Trimmed with thick waxed thread. Available in 7 sizes. Please measure dog's neck for proper fit. 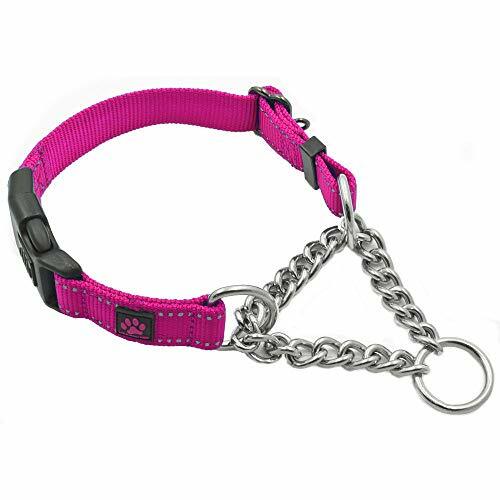 Our big dog adjustable martingale collar is great for the bigger dogs out there. We use extra thick, full grain leather, add multiple rows of rivets along with grommets for the buckle prong holes to help prevent stretching and deformation. Includes a half-check chain with welded D and O-rings, double cap rivets for strength, multiple attachment points for tags or lights and a smooth rolling buckle. The collar opens fully to adjust, so you do not need to worry about how thick your dog's head is when ordering. Important Sizing Information. Our martingale collar sizes are measured at its largest -- i.e. when the collar is relaxed. When sized correctly, the collar should shorten by 2" when pulled taut. We recommend you measure your dog's neck and add 1" to match up with our listed sizes. Please do not leave dogs unattended while wearing martingale or choke collars, these are meant for use while walking.